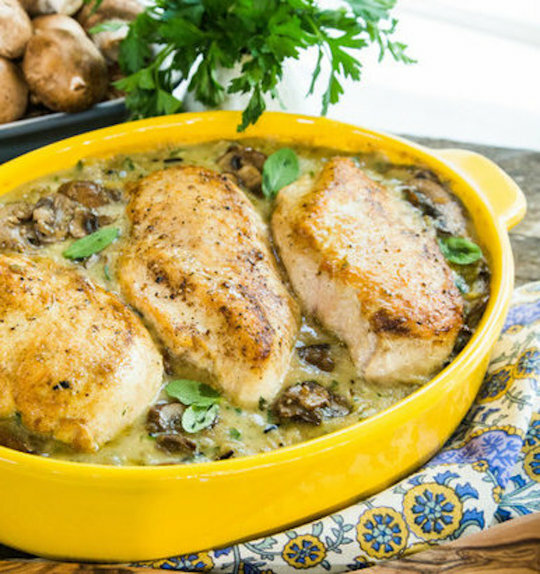 VAEATS friend Cynthia Graubart [LINK], author of “Sunday Suppers: Simple, Delicious Menus for Family Gatherings,” [LINK] shares her recipe for Chicken Mushroom Casserole from the book. She recently appeared on the Hallmark Channel’s “Home & Family” show, demonstrating how to make the dish. 1. Preheat oven to 375F. Melt 1 tablespoon butter in a large skillet over medium-high heat; add half of chicken, and cook 3 minutes or until browned; turn and cook 1 minute. Transfer to a plate. (Chicken will not be cooked completely.) Repeat procedure with 1 tablespoon butter and remaining chicken. Wipe skillet clean. 2. Melt 2 tablespoons butter in skillet over medium-high heat. Add shallots, and sauté 3 minutes or until translucent. Add garlic, and sauté 30 seconds. Add mushrooms; cook, stirring often, 4 to 5 minutes or until tender. Stir in sherry, and cook, stirring often, 1 minute. 3. Melt remaining 1⁄4 cup butter in a 3-quart saucepan over medium-high heat. Whisk in flour; cook, whisking constantly, 1 minute. Gradually whisk in broth. Bring to a boil, whisking constantly, and cook, whisking constantly, 1 to 2 minutes or until slightly thickened. Remove from heat, and add rice (reserve flavor packet for another use), next 5 ingredients, and shallot mixture. Spoon into a lightly greased 13- x 9-inch baking dish. Top with chicken. 4. Bake at 375F for 30 to 35 minutes or until a meat thermometer inserted in thickest portion of chicken registers 165°F. Remove from oven, and let stand 10 minutes. Sprinkle with almonds.